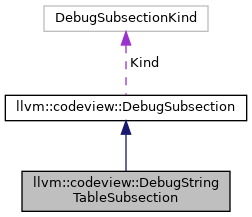 DebugStringTableSubsection owns the underlying storage for the table, and is capable of serializing the string table into a format understood by DebugStringTableSubsectionRef. Definition at line 56 of file DebugStringTableSubsection.h. Definition at line 44 of file DebugStringTableSubsection.cpp. Definition at line 78 of file DebugStringTableSubsection.h. Definition at line 60 of file DebugStringTableSubsection.cpp. Definition at line 60 of file DebugStringTableSubsection.h. References llvm::codeview::DebugSubsection::kind(), llvm::size(), and llvm::codeview::StringTable. Definition at line 64 of file DebugStringTableSubsection.cpp. Definition at line 82 of file DebugStringTableSubsection.h. Definition at line 97 of file DebugStringTableSubsection.cpp. References assert(), llvm::StringMap< ValueTy, AllocatorTy >::end(), and llvm::StringMap< ValueTy, AllocatorTy >::find(). Definition at line 103 of file DebugStringTableSubsection.cpp. Definition at line 47 of file DebugStringTableSubsection.cpp. References llvm::StringMap< ValueTy, AllocatorTy >::insert(), P, and llvm::StringRef::size(). Definition at line 86 of file DebugStringTableSubsection.cpp. Definition at line 88 of file DebugStringTableSubsection.cpp.